1.) How early/late can I apply? 2.) Can I apply if I haven't graduated yet? 3.) Should I get a TEFL/TESOL qualification? 4.) Are there any fees? 5.) What language do they speak in Georgia? 7.) Will I be placed in conflict regions? 8.) What requirements do I need in order to qualify to teach with TLG? 9.) How do I obtain medical documentation? 10.) How do I obtain a criminal record check? 11.) Are there any guidelines or requests for letters of recommendation (LOR)? 12.) What if my documents are not in English? 13.) Can I apply with my friend/spouse/significant other? 15.) Can I bring pets? 16.) Is there visa support? 17.) What benefits does the program offer? 18.) When can I join the program and when is the application due? 19.) How long will my contract be? 21.) Can I extend my contract once I am in Georgia? 22.) What if I worked for TLG, left and now want to reapply? 23.) How do the flights work? 24.) Is it possible for TLG to give us money instead of a ticket? 25.) Do I need to get any vaccinations? 26.) What documents should I bring to Georgia? 27.) Should I bring a gift for my host family or co teachers? 28.) How much money should I bring with me to Georgia? 29.) What is the cost of living in Georgia? 30.) Will I be able to use my credit card(s) in Georgia? 31.) Is it possible to save money while working for TLG? 32.) What is the average cost/minute for a cell phone call? 33.) Should I bring my laptop? 34.) What happens when I arrive in Georgia? 35.) Will a cellular phone be provided? 36.) How will I receive my stipend? 37.) What kind of training will I receive? 38.) What is my stipend calculation start date? 39.) When will I meet my host family? 40.) Can I decide where I want to live? 41.) Will I have internet access? 42.) Can I receive mail or packages? 43.) I am a vegetarian - will this be a problem in Georgia? 44.) Do I have to pay taxes in Georgia? 45.) What grades will I teach? 46.) What is the actual time spent in the classroom during a typical week? 47.) What will my main responsibilities be during classroom instruction? 48.) How many students will be in one class? 49.) Will I have access to materials such as printers, textbooks, and workbooks? 50.) What school supplies/teaching aids should I bring? 51.) Will I be in charge of creating my own lesson plans or will I follow a curriculum? 52.) What should I wear at school? 53.) What form of transportation do most TLG Volunteers take to school? 54.) How many other TLG Volunteers will be teaching at my school? 55.) Is it easy to meet other TLG Volunteers in Georgia? 56.) What dates are the public schools in session? 57.) Are there additional professional opportunities when working with TLG? 58.) Can I teach extra lessons to make additional money? 59.) When can I take time off for vacation? 60.) What are the official holidays in Georgia? 61.) Can I travel to another country while volunteering in Georgia? 62.) Where will I live? 63.) What type of accommodation will be provided? 64.) Will I have running water and electricity? 65.) Are the host families given any training regarding how to host Volunteers? 66.) Do I pay for my accommodation? 67.) Do I pay my host family directly, or is it automatically taken out of my monthly stipend? 68.) Will my host family speak English? 69.) Are we responsible for giving English lessons to the host family members? 70.) What kind of support will there be if I have a problem with my host family? 71.) Is it possible for me to find my own housing? You should start preparing to apply approximately 3-4 months before your intended start date. The final deadline for submitting all of your documents to TLG is three weeks before your start date. Getting your documents gathered and preparing yourself to move to Georgia can take a few weeks as well. Click here to apply. Yes. ESL Certified will accept your application and get the application process started, so that you are ready to begin your assignment when you graduate. However, you will need to submit a copy of your degree to TLG before you get started so make sure that you will receive your degree at least three weeks before you plan to arrive in Georgia. Click here to apply. A teaching certification is not required but the more teaching knowledge and skill you have the better you'll perform. If you're interested in getting TEFL qualified, we recommend taking one of our certification courses. Please click here to get more information. Teaching English through the TLG program in Georgia is completely free. There are no fees to be paid to TLG or to ESL Certified. The only expenses that you will have are for the required documents, such as a criminal background check, and for your health check. Of course, you'll also want to bring some money for additional expenditures that you might incur while you are in Georgia. Click here to apply. Absolutely! However, just like in any country, you should exercise some caution: be aware of your surroundings, keep an eye on your belongings, don't walk alone late at night, etc. TLG provides volunteer teachers with the training, information, and support that they need to stay safe during their time in Georgia. You will need to fill out a medical self-assessment form and provide your examining physician with the medical examination report form for them to fill out. Alternatively, applicants can complete their medical examination in Georgia upon arrival. In this case, applicants only need to submit the medical self-assessment form prior to their arrival. There is not a specific recommendation letter form for TLG applicants. The authors of LORs should describe the applicant's general abilities and explain why he or she would make a good volunteer for Teach and Learn with Georgia. It must be written by a person who has been in professional and/or academic contact with the applicant. He or she can be an applicant's professor, supervisor, employer, etc. More details will be given once you apply. If your medical documents, certificates, CRCs, etc. are not in English, you need to provide an official notarized translation of the documents. The couple will be placed in different host families but as close to each other as possible. The couple can find and rent an apartment or house on their own. TLG will assist with communicating with the landlord, but we cannot provide any financial support. 14.) Can I bring my children? Citizens of many countries do not need a visa to arrive and stay in Georgia for up to 360 days. If an applicant does need a visa, however, TLG will send them a letter of invitation once he/she is accepted as a TLG Volunteer. The TLG Team will assist with obtaining a visa, but please note that we will not be able to reimburse visa-related fees. Applicants from the countries marked in red do not need to obtain a visa for stays up to 360 days. Upon successful completion of his/her contract, each Volunteer receives a letter of recommendation from TLG and a certificate signed by the Minister of Education and Science of Georgia and the Director of the National Center for Teacher Professional Development signifying the Volunteer's dedication to the program. *The monthly stipend is 625 GEL. After taxes, the net amount directly deposited into the volunteers' personal bank accounts is 600 GEL Monthly (approx. $300 USD), volunteers give their host families 200 GEL to cover food and utilities. TLG Volunteer contracts have start dates throughout the year. Completed applications are due three weeks prior to the intended date of arrival. Click here to apply. Contracts can be signed for one or two semesters and can last anywhere from 3 to 15 months, depending on the number of semesters and the start date of the contract. Yes, you may extend your contract for one or two semesters at a time once you are in Georgia. Contract renewal is based upon a performance evaluation by the TLG Team. We love welcoming back former TLG Volunteers! Volunteers whose contract ended under normal circumstances or for emergencies are eligible to reapply to TLG. Instead of resubmitting an entirely new application, you just need to give us an updated Criminal Background Check and updated Medical Documents. As with new applicants, CRCs and Medical Documents cannot be more than two months old by the intended date of arrival. Your flights are paid for by TLG. Once you are accepted to the program you must provide us with the two most convenient departure airports and we will book your flight from one of the two. Most of the time, flights depart two days before your intended start date. For example, if you are scheduled for a September 30th start date, your flight will most likely depart on September 28th. Flight information typically comes the week of your departure and will be forwarded to you via email. TLG will not pay for the costs of checking additional baggage or any additional expenses associated with your travel to Georgia. You are responsible for getting yourself to your departure airport(s). No. Under no circumstances will TLG consider giving Volunteers money instead of an air ticket. We recommend consulting your physician to determine which vaccinations are recommended based on your health and past vaccination history. Because you will be working with children, you may want to consider making sure that your hepatitis and TB shots are up to date. If you plan on traveling to other countries, don't forget to ask your physician about any recommended vaccinations for those countries, too! Upon your arrival in Georgia we will need to verify the original copies of your medical documents and your Criminal Record Check. If you did an online Criminal Background Check, the electronic copy will be sufficient. Keep your boarding passes! Although it is not necessary, it is a great idea to bring a few small gifts with you for your host family and co-teachers. It would be nice to bring something that represents where you are from. Common gifts are chocolates, wine, coffee mugs, t- shirts, etc. TLG Volunteers receive their stipend at the end of each month, so you will need to bring enough money to get by in Georgia until your first monthly stipend is received. We recommend that you bring approximately one month's stipend to address any potential first month expenses, such as tourism, food, and transportation in Tbilisi during your first week, gifts for host family/co-teachers, school supplies, telephone minutes, internet, unforeseen expenses, travel, or things you may have forgotten to pack or bring to Georgia. Keep in mind that if you need to purchase a visa to enter Georgia you should bring 100 GEL (~60 USD) for that, and if you intend to get your medical check done in Georgia you will need about 70 GEL (~45 USD). The cost of living in Georgia is relatively low. A loaf of bread costs 0.8 GEL (0.40 USD) while a 500 ml bottle of water will cost approximately 0.6 GEL (0.35 USD). The use of credit cards in Georgia is rare. Some places in cities such as Tbilisi will be able to accept credit cards but most places will only accept cash. There are ATMs throughout all towns and in some villages. Frugal living can allow TLG Volunteers to save a little money. Volunteers who live in rural areas typically spend less than Volunteers placed in cities. 600 GEL per month is an average wage in Georgia and as a result, Volunteers should not expect to be able to accrue great savings during their time in Georgia. TLG Volunteers will get the cell phone and a phone number that is connected to the corporate network. TLG's corporate plan provides free calls to TLG Staff and other TLG Volunteers. This plan costs the Volunteer about 5 GEL each month. Other calls and texts cost extra. The average cost per minute to other phone numbers is 0.24 GEL, international calls are more expensive. Yes, most TLG Volunteers do. Representatives of the TLG Staff will be at the airport to meet you and arrange your transportation to the training location. TLG Volunteers receive a cell phone upon arrival in Georgia. TLG Staff and other TLG Volunteers can be called free of charge from this phone. Volunteers must return their cell phones to TLG at the end of their contract. All TLG Volunteers will have a bank account opened for them before they arrive. Each month your stipend will be directly deposited into this bank account. Upon arrival, each group spends one week together in Tbilisi at Orientation Training. The main components of Orientation Training are Intercultural Training, Georgian Language Lessons, Teaching Methodologies, Volunteer Safety and Security, Safe Transportation, and Information Sessions. Information Sessions will be held with TLG's Medical, Legal, Academic and Non-Academic Teams as well as bank, medical insurance and cell phone provider representatives. You begin accruing your stipend from the first day of the Orientation Training. Your payment is calculated from the first day of your Orientation Training. You will meet your host family on the final day of your training in Tbilisi. Vegetarians are not very common in Georgia, but maintaining a vegetarian diet is definitely possible. Georgians eat lots of bread, cheese, fruits, vegetables, pasta, and nuts. If you explain to the family that you cannot eat meat, they will understand and try to cook meals that take your needs into consideration. Additionally, many restaurants offer a vegetarian "fasting menu" for religious reasons. Your stipend of 600 Lari is what you will receive after taxes. During orientation, representatives from TLG will help you fill out all necessary tax forms. TLG Volunteers will only work with the primary grades (1-6). 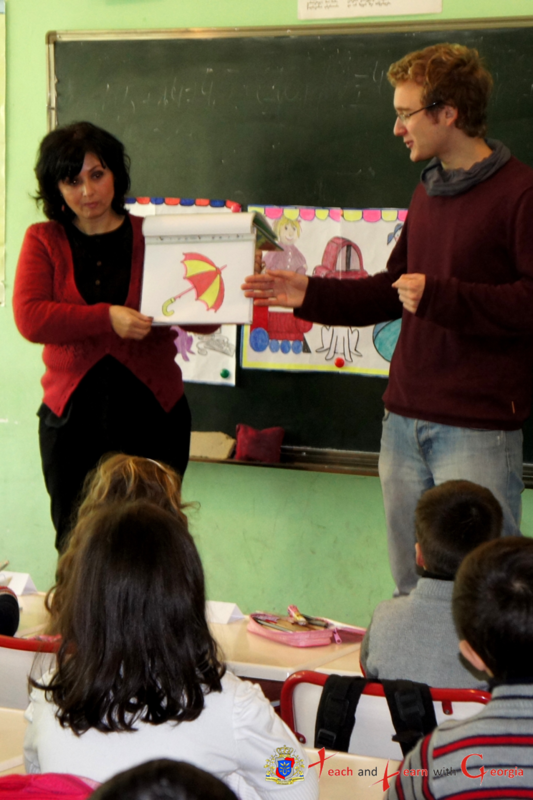 TLG Volunteers will be co-teaching with a Local English Teacher in the classroom. They will be teaching primary school (grades 1 through 6). Volunteer's primary responsibilities are to assist with speaking and listening lessons, although each Volunteer will be responsible for determining his/her working relationship with their Georgian co-teacher. Resources are extremely limited in Georgian schools. Flash cards, pencils, erasers and pencil sharpeners are some of the basic supplies recommended by former TLG Volunteers. We also recommend bringing pictures of your family, home, and country-anything that will help you to tell the students who you are and where you are from will be greatly appreciated. Most importantly, bring your creativity and eagerness to make a difference in the lives of your students! While at school you should dress cleanly, conservatively, and professionally-not necessarily dress suits or coats and ties, but presenting a professional appearance according to Georgian cultural standards. This means dresses, skirts, and dress slacks for women (depending on the location; some schools in rural areas do not allow pants) and slacks and button-down shirts for men. 14 October - "Mtskhetoba "
All host families receive a hand-out with detailed guidelines on how to host a Volunteer. Additionally, host families are asked to attend an informational meeting with the TLG Staff on the last day of their volunteers' Orientation Training.